Does the sanitary technology work? The principle of NoMix is simple: urine is collected separately from other wastewater. But, in practice, this is still not as simple as it sounds – especially when it comes to sanitary technology. For example, pipes may be blocked by urine scale, and designing and producing a modern NoMix appliance is a costly enterprise. Novaquatis approached these problems in various ways: through research on precipitation, feedback from pilot projects and round-table discussions to explore the interests of the parties concerned. 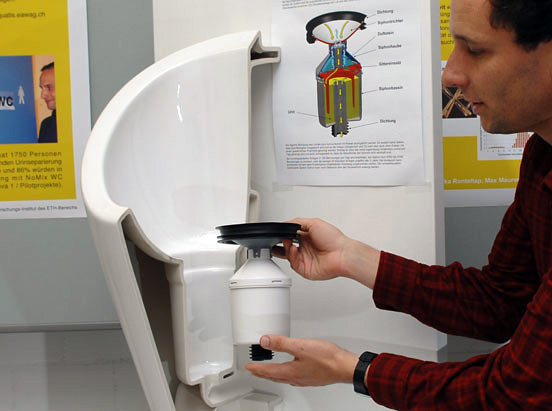 The modern water-flush NoMix toilet was invented in Sweden in the 1990s. The principle is straightforward: when the user sits on the toilet, urine is collected at the front and drained into a separate tank, while at the back the faeces are flushed away in the normal manner. The appliance thus, in effect, consists of a toilet with a built-in urinal. But this simple principle involves certain practical difficulties. As in the case of waterfree urinals, mineral deposits – popularly known as urine scale – build up over time, and pipes may be blocked as a result. This and other sanitary technology-related problems raise a number of questions: How can clogging of the pipes be avoided? On a NoMix toilet, what sitting position is both comfortable and functional? Does separation work in practice? Does this kind of toilet fit in with a modern bathroom, or does it look anachronistic and old-fashioned? If necessary, how can NoMix toilets be improved? In the overall NoMix system, the new toilet technology plays a significant role. Answers to the above questions were sought in several Novaquatis work packages: Nova 1 (how do users react to the technology? ), Nova 2-1 (how can innovations be achieved? ), Nova 2-2 (how does precipitation arise? ), Nova 3 (is source separation successful? 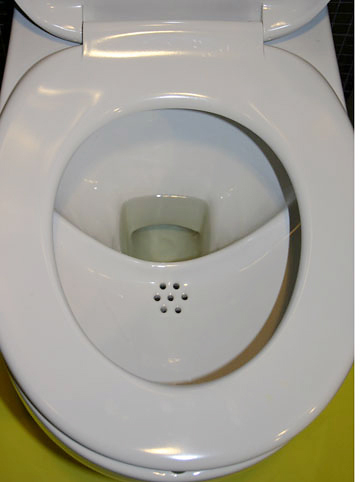 ), Nova PP (can pilot projects already be carried out with existing NoMix toilets?). A number of conclusions can be drawn from the various projects: although the existing NoMix toilets are not perfect, it is certainly possible to use them in pilot projects (Nova 1, Nova PP). The major problem of precipitation remains unresolved (Nova 2-2). There are thus good reasons to pursue further development of the NoMix toilets (Nova 2-1). In the 1990s, Novaquatis participated in the development by Roediger (www.roevac.com) of a new NoMix toilet permitting the collection of undiluted urine. This appliance was used in Novaquatis pilot projects, and the new Eawag building is fitted exclusively with the Roediger NoMix toilet, in addition to a variety of waterfree urinals. The experience gained through Novaquatis was communicated to the manufacturer and should now provide a basis for the development of a new-generation, functionally enhanced Roediger NoMix toilet (cf. "Practical guide"). With today's sanitary technology, pilot projects are practicable at workplaces, for example, but in private households they remain problematic (Nova PP). However, the system can only be developed to maturity through large-scale pilot and demonstration projects. In round-table discussions at four workshops involving representatives of the sanitary and wastewater sector, we explored what was required to enable an optimal NoMix toilet to be introduced. It transpired that, for the companies concerned, a clear definition of the initial markets is indispensable. These also need to be sufficiently large to make commercial production worthwhile. Major markets are to be found where major problems exist. As well as rapidly expanding cities in fast-industrialising countries (Nova 8), this could include water-scarce regions such as Australia or China. In contrast, the step-by-step approach envisaged in Swiss transition scenarios (Nova 3) is unattractive for the industrial partners, as the market is judged to be too small. In addition, the development process is complicated by the large number of parties involved. As previously noted , if companies are to be prepared to make more substantial investments, it is crucial that wastewater professionals should begin to take a much greater interest in the NoMix technology. Essentially, the sanitary industry is interested and considers the task to be feasible. However, all the solutions entail additional costs, and since these are incurred by households, while the savings are made by local authorities, the costs would have to be transferred through an ingenious financing model. Nova 2-2 consisted of a doctoral thesis investigating precipitation in toilets and in waterfree and conventional urinals with the aid of field measurements, laboratory experiments and computer simulations [2 – 6]. 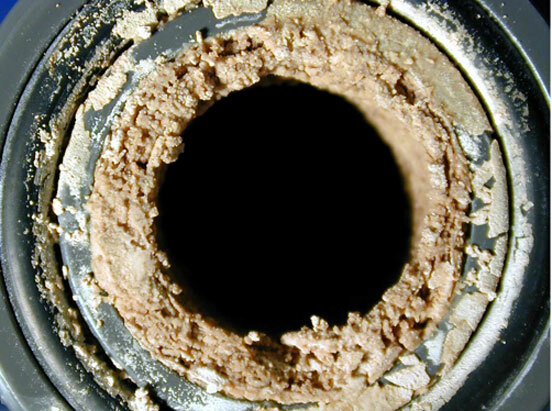 Precipitates accumulating in pipes and siphons can lead to blockages after only a few thousand uses. When urea from urine is degraded (hydrolysed) by bacteria, the pH rises sharply, up to 9 or more. As a result of shifts in the buffer systems, the solubility product of various poorly soluble salts is exceeded, leading to crystallization. This is true in particular of struvite (magnesium ammonium phosphate, MAP) and various calcium phosphates. Ureolytic bacteria mainly grow in the pipes and are flushed into the collection tank. After only a few days, the urea is completely degraded. In undiluted urine, hydrolysis of only 8% of the urea is sufficient to increase the pH to almost the maximum value, with 95% of the possible precipitation being attained as a result. Following the initially favourable experience with waterfree urinals, it was long believed that no salts would crystallize from undiluted urine. However, field measurements indicated that the opposite is the case – i.e. blockages occur mainly when the urine is only slightly diluted or completely undiluted. Calculations based on computer modelling showed that less precipitation of salts per volume occurs with diluted than with undiluted urine. The least precipitation occurs when rain water is used for flushing, as this avoids the addition of either calcium or magnesium. Although the quantity of precipitates is one of the main factors giving rise to blockages, it is not the only one. Also critical are narrow diameters and prolonged residence of urine in pipes and siphons. The combined results from Nova 2 provide a number of indications as to what could be done to bring an improved NoMix toilet to the market, and what fundamental changes would be required. Although urine dilution reduces blockage-related problems, it entails the use of larger urine tanks. In addition, it complicates urine treatment. A better solution might therefore be the deliberate promotion of unavoidable precipitation in undiluted urine – in a replaceable unit in the toilet. This principle is already applied by the industry in various waterfree urinals. For the NoMix toilets available today, however, the problems need to be solved pragmatically or alleviated, e.g. by rainwater flushing systems (cf. "Practical guide"). The sanitary industry is in principle interested in bringing good-quality NoMix toilets to the market and is convinced that this goal is achievable. However, as they are more expensive than conventional toilets, wastewater professionals, for their part, need to identify sizeable markets that would make it worthwhile for the industry to become involved and to undertake costly development work (cf. Nova 7). Udert, K.M., T.A. Larsen, M. Biebow, W. Gujer (2003) Urea hydrolysis and precipitation dynamics in a urine-collecting system. Water Research 37(11): 2571–2582. Udert, K.M., T.A. Larsen, W. Gujer (2003) Estimating the precipitation potential in urine-collecting systems. Water Research 37(11): 2667–2677. Udert, K.M., R. Högger, T.A. Larsen, W. Gujer (2004) Fällungsprodukte in Urinalen und NoMix-Toiletten. gwa (Gas Wasser Abwasser) 12/2004: 913–920.